How to Enhance Your Smile with Dental Bridges? Home Blog How to Enhance Your Smile with Dental Bridges? Home » How to Enhance Your Smile with Dental Bridges? What is a dental bridge? A dental bridge is an immovable dental prosthesis that is used to substitute one or some missing teeth by lastingly joining a false tooth to neighboring teeth or dental implants. 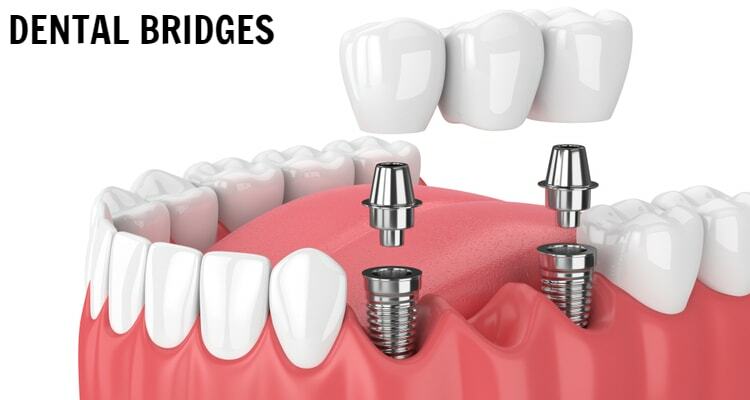 The dental bridges are also used to safeguard and restructure teeth that have endured major annihilations and avert difficulties that may arise as a consequence of tooth loss. There is an extensive selection of teeth bridges. The type of bridge that is intended for a particular clinical condition is influenced by many factors such as topographical location, patient needs and financial situation, dentist inclinations etc. 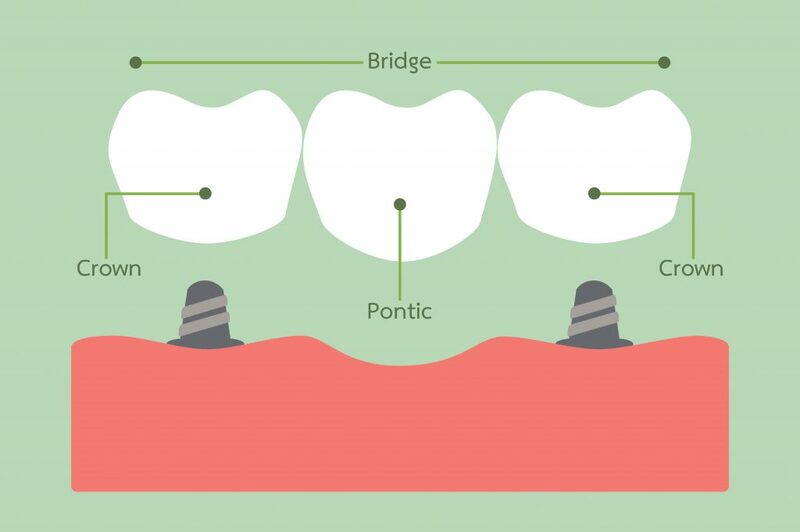 Being the most prevalent kind of bridge, these bridges comprise one or more pontics (artificial teeth) and are held properly by dental crowns. 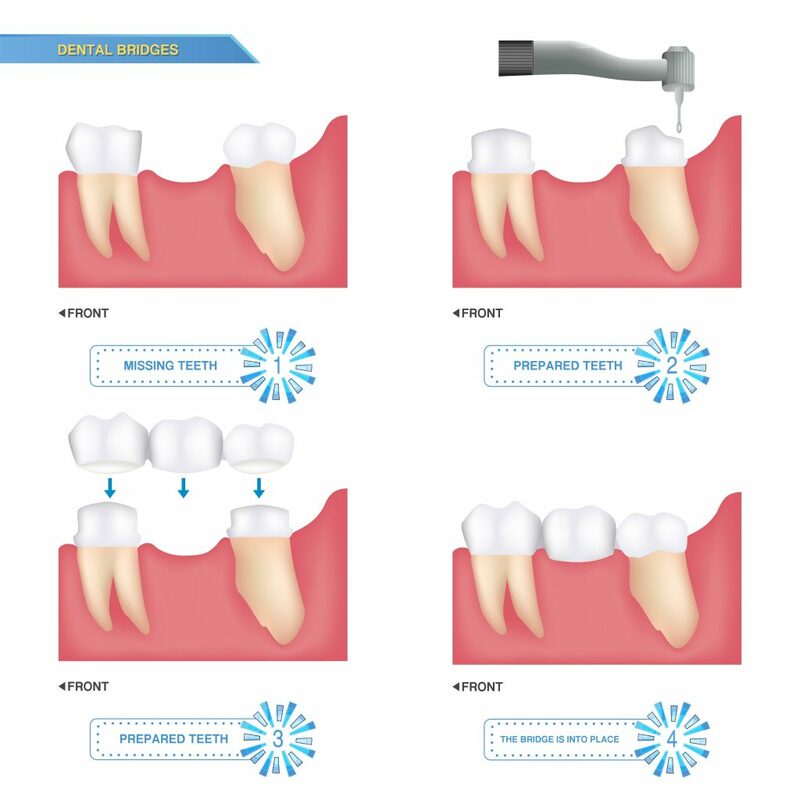 The dental crowns are also termed abutments, which are paved onto the teeth end-to-end to the missing tooth. Cantilever bridges are an extra alternative for substituting absent teeth. They are very alike to traditional bridges; however the pontic is reinforced by an abutment on only one side, rather than on equal sides. Therefore if there’s only solitary natural tooth next to the gap, a bridge can still be tenable. Maryland bridges are deliberated as a convenient alternative to traditional bridges. Such kind of teeth bridges can consist of a pontic that is held in place by a metal or porcelain structure. This structure is fused onto the backs of the two teeth nearby to the missing tooth. Subsequently, this type of bridge isn’t held in place by crowns, the adjacent teeth don’t require to be filed. Who is the right candidate for dental bridges procedure? A person missing between one and three consecutive teeth is in a sensibly good health and is free from gum disease then he/she is probably a good candidate for a dental bridge. Having a gum disease shall be addressed before placing your bridge. To be a worthy candidate for a fixed dental bridge procedure, you must have natural teeth that are adequately strong and healthy to upkeep the crowns that hold the bridge in place. How is the dental bridge procedure performed? This procedure is a multi-step course that grosses more than one visit to the dentist. Once you’re in the dental chair, the dentist administers a local anesthetic into the gum flesh adjacent to the tooth next to the bridge. Then the reshaping of the teeth will be done to house the crowns, whichever by filing down segments of the tooth or filling them. The crowns must fit firmly in order to hold the bridge in place. When the teeth have been appropriately reshaped, your dentist will make an imprint of the missing tooth and the adjoining teeth. This imprint is sent to a laboratory to tailor a bridge that fits your mouth precisely. Until the bridge is industrialized and reverted to the dentist’s office, you should consequently obtain a temporary bridge protected by cement to fill the unfilled space. The permanent bridge should reach your dentist’s office within a few weeks, at which period you’ll attend a follow-up visit to have the permanent bridge positioned. Some of the settlement includes making sure the bridge doesn’t inhibit with your bite alignment. How long does the material of teeth bridges last? Teeth bridges can last 5 to 15 years and even extendedly. Through good oral hygiene and steady checkups, it is not uncommon for the lifespan of a fixed bridge to be over 10 years. Are there any risks or complications associated with teeth bridges? 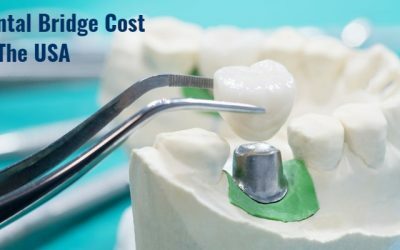 The cost of dental bridge differs contingent on the type of bridge carefully chosen and the area of the country in which the technique is performed. Dental insurance will normally pay a percentage of the fee subject to the individual dental plan. How to take care of teeth after having teeth bridges? Brush twice a day with toothpaste that helps preserve a dentist-clean feeling with advanced-cleaning silica comparable to what dentists use. Floss once a day below the artificial tooth as well as among your natural teeth. You can use regular floss or a proxy brush, which is a small brush, intended to get into all the nooks and crannies amid teeth. Visit your dentist or dental hygienist frequently for a specialized cleaning. Eat a diet high in fruits, vegetables and fiber than meat. Do you want to have dental bridges that can enhance your smile and treats the underlying dental problem? If yes, visit Aliso Niguel Dental Group – a dental health care center offering the best, safest and effective dental treatments to men, women, and children. You will be treated in the most comfortable and relaxed environment by our American board-certified dentists, who are skilled, accomplished and experienced in providing the customized dental treatments. Just book an online appointment by visiting our website or simply call 949-643-7047 for an immediate response. What Causes Teeth Sensitivity & How to Treat It? How Much Does A Dental Bridge Costs In The USA?